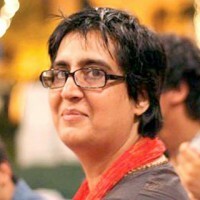 KARACHI: At ‘Unsilence Pakistan: A Tribute to Sabeen Mahmud’, the murdered activist was remembered first under the fading light and then the starless night sky at Arts Council’s open-air auditorium. It was an event of tear-filled eyes, of choked throats, of reminiscent nods and of fond memories left behind. An event where Sabeen’s legacy was carried on. It was fitting then that the opening speaker was mentor Zaheer Kidvai – the man who saw Sabeen become the woman she became. As the clock ticked towards the event’s end and the last of the speaker had left the stage, it was clear that the echoes of Sabeen rang as loud, clear and proud as they ever had; but after hearing the speakers highlight the plethora of problems facing Pakistan, the echo seemed but hollow in this festival of chaos.